Continuing with our series on the characteristics of smushies, this time we focus on the deliciousness factor, probably the most important one. We’ve put a great deal of focus on combining flavors to get the biggest bang for the bite. Some of this was already in place with the traditional smørrebrød recipes and we’ve enhanced that by developing our own versions with combinations known to please the palate. Annette regularly consults “The Flavor Bible” by Karen A. Page and Andrew Dornenburg. It’s a tremendously helpful resource. We’ve held numerous tasting parties to be sure it wasn’t just us who thought our smushies were all that. Hopefully it’s not just the presence of the Akvavit liqueur that is swaying them. We’ve always received very positive feedback from our samplers and are constantly asked when the next tasting will be. Eva and Ole act as our taste monitors, too. They have authentic Danish taste buds and they’ve tasted just about everything we’ve made. They provide honest, straightforward critiques. Eva is very practiced at figuring out what can turn a “so-so” dish into a “wow” dish. Ole definitely has a sweet tooth and loves when we experiment with pastries. We made these mouth-watering treats, tebirkes (tier-beer-kiss, roughly) recently. 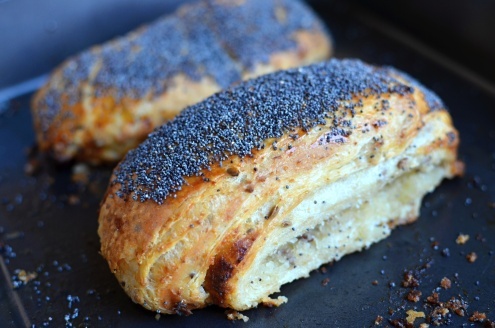 These are multi-layered pastries sprinkled with poppy seeds, with marzipan in the middle. Some claim tebirkes are to Denmark what the croissant is to France. 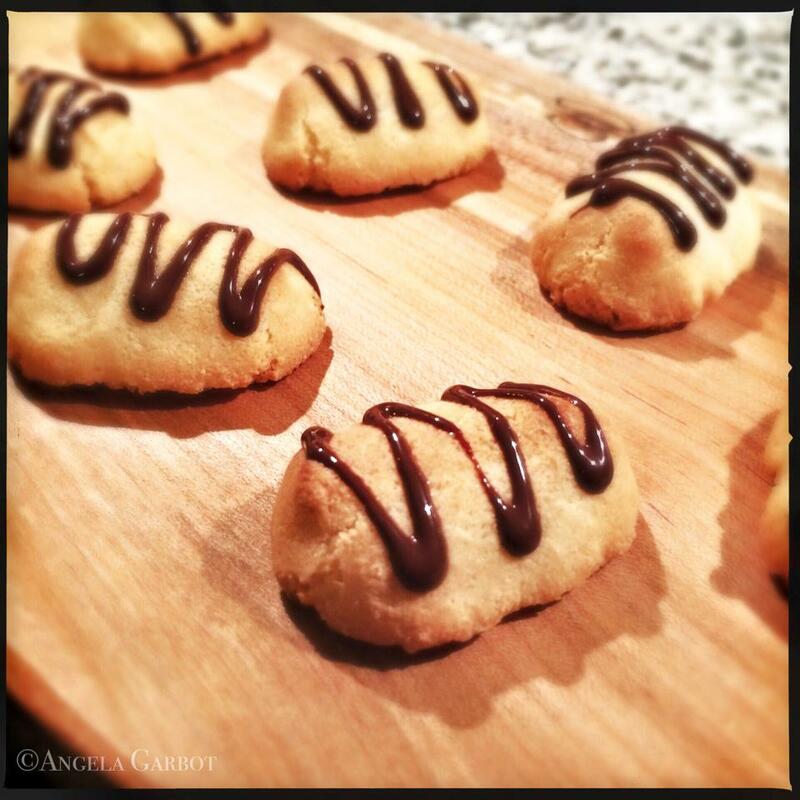 Just the other night we made a smorgasbord of treats, including these little beauties, kransekage stykke (kron-sǝ-kī-ǝ stook-ǝ). These are relatives of the traditional kransekage wedding cake. They’re surprisingly crunchy on the outside and chewy on the inside. Part of the fun of this project is creating delicious combinations. The first time I tasted our ham and roasted asparagus smushi, I could have sworn I tasted bacon. 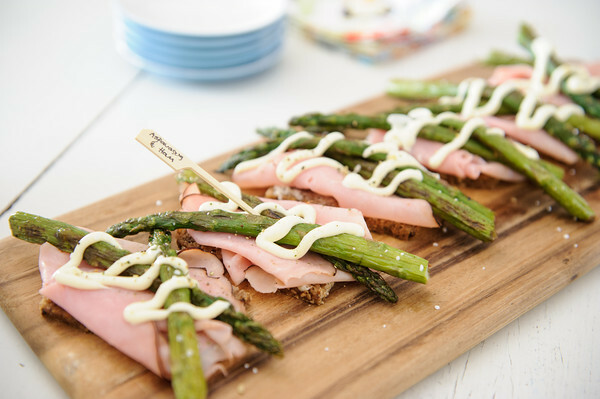 The pairing of the asparagus fresh from the pan and the salty ham produced that sensation. It’s absolutely delicious. But it still comes second to our roast beef smushi with fried onions and horseradish sauce. That one is a delight and makes my mouth very happy.